SeceuroGlide’s sectional range of garage doors provide a great variety and choice of garage doors to suit every need, whether it be style, function, security or ease of operation that you want. SeceuroGlides’s garage doors look fantastic but also provide a quality, reliable garage door, with great security that’s easy and safe to operate. SeceuroGlide doors are made to measure so you get the perfect fit, no gaps and therefore great insulation against the element. So we start there and then you choose the rest so you get the garage door that exactly fits your requirements. There’s a garage door style that will match and improve the look of your house and you get to choose that and the following:-. This is where you can truly create your perfect garage door. Our doors are available in any RAL colour or BS colour, SeceuroGlide Sectionals provide the opportunity to match your door to your windows, front door or even your car! We offer a large range of colours to choose from and even include metallic colours for something really special. Finally, you can choose a finish for your garage door, from smooth or embossed and then of course accessories. You may want more natural light in your garage and so you can have portholes, from a selection of stainless steel porthole windows with glazing options and a variety of aluminium handles. You even decide where your accessories are positioned. Our SeceuroGlide garage doors are not only great looking, but come in a vast choice of styles, colour, finishes, with a choice of accessories and they are built to fit your garage and your specifications. Automated control means the doors can be operated with just the touch of a button, unlike the rather more difficult opening of with traditional up-and-over garage doors. The Black Edition operator features a unique locking system for added security. 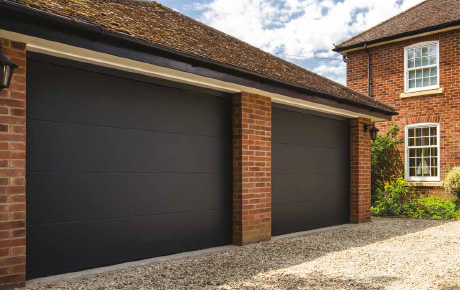 If you value your time and don’t want to spend your weekends cleaning the garage, you’ll love the low-maintenance finish of our SeceuroGlide doors, especially if you opt for Anthracite Dura – our most durable finish, which does a fantastic job of minimising dirty marks. We value your safety, so the finger-safe design of SeceuroGlide garage doors ensures fingers cannot be caught or trapped between the panels, meaning the door can be safely operated around pets and children without worries. SeceuroGlide garage doors have insulated panels that keep the heat out on hot days and in on cold days. Engineered by industry experts, manufactured in the UK and developed to the highest specification, SeceuroGlide Sectionals are the only doors to feature a unique track connecting system, which allows the installer or engineer to adjust the tracks, ensuring your door will run smoothly for years to come. With superior components, expert manufacturing and fully approved installers, our sectional garage doors provide not just a sleek design, but a quality finish as well. So for a beautiful bespoke garage door from SeceuroGlide’s range, contact Cladfit for a free no-obligation quote on replacing your garage door.